The most popular methods of compensation in the advisory industry have always irked me. Traditional, commission-based brokerage models are sketchy at best. They are fraught with misaligned incentives and more often than not, investors are left dealing with salespeople, not advisors. One industry solution to the commission problem was the emergence of fee-only advisors. Since fee-only advisors are only paid by their clients, their financial interests are better aligned with those of their clients’. Unfortunately, most fee-only advisors choose to be compensated through an assets under management fee arrangement (AUM fee). Under this arrangement, a client pays an annual retainer fee based on a percentage of their total assets being managed by the advisor. Not only can this fee structure be incredibly expensive, but it is discriminatory and creates its own set of poor advisor incentives. This system ends up fleecing the investors who put capital at risk and rewarding advisors through fees largely out of proportion with the services being provided. The first question to ask yourself is, do the fees paid over the course of twenty years look reasonable? Most people don’t think about these fees since they get skimmed off the top. But what if you had to deliver a briefcase of $64,000 to your advisor in person? Would you do it? A second observation can be made by comparing this compensation structure to similar, service based industries. Would it be reasonable for an accountant or estate attorney to charge two different clients, who they did the same amount of work for, wildly different prices based solely on the amount of assets they had? Of course it wouldn’t. To some, a good advisor may be worth 1-2%. If an advisor brings that much value to somebody’s life and financial situation then that type of fee may make sense. One has to ask though, is it really $64,000 worth of value? When I really started thinking about it, it became clear to me that asset-based fees for financial advice are ridiculous. So why then, is this practice so widely accepted? From experience, I’ve seen very little correlation between the size of a portfolio and the amount of work required to manage it. Some clients have more complicated financial situations than others but generally speaking, the workload for most clients, regardless of portfolio size, is similar. Yes, I understand there is a difference between managing $1 billion for a pension fund and $1 million for a retiree, but that isn’t what I’m talking about. I’m talking about an advisor charging a client with a $5 million portfolio 5x more than the client with a $1 million portfolio. That advisor probably isn’t doing 5x the work for the larger portfolio. If he is, there’s something wrong. I bought this one for a while. I get it. If an advisor returns 10% on a $5 million portfolio, the client made $500k. If the advisor returns 10% on a $1 million portfolio, the client makes $100k. Why shouldn’t the advisor get paid more for making more? Ask an AUM advisor, “Do you really think you’re doing $50,000 worth of work for that one client?” Speaking candidly, they’ll probably say no. The truth is, even if an advisor thinks their fees are way too high, once AUM fees are ingrained in a business model, it’s tough to change. Do you think Merrill Lynch or Wells Fargo shareholders will willingly accept massive declines in revenue simply because their advisors think charging somebody $50,000 a year to manage a $5 million portfolio is unreasonable? Of course not. Even smaller advisors who built their practice on the AUM fee model will have a difficult time backing out of it. The theory here is that advisors will work extra hard because their compensation is tied to how well their clients’ portfolios perform. There are two very obvious problems with this line of thinking. First, if the advisor is truly acting in a fiduciary capacity they are legally required to act in their client’s best interest at all times. They should not need an added incentive to do that. Second, the argument posits that advisors have some direct control over portfolio growth…they don’t, the markets do. A typical AUM fee for advisors is around 1%. Take, for example, a client with a $1 million portfolio that returns 7% per year. Over the course of 20 years, that client will pay $387,000 in advisory fees. That is 18% of their long-term investment gains and an average of nearly $20,000 per year! Not only are the cumulative fee totals ridiculous, but their impact on total investment returns can be massive. Let’s consider a different fee model. An advisor charges a price he believes is more appropriate for the services being provided; a flat, annual retainer fee of $5,000. 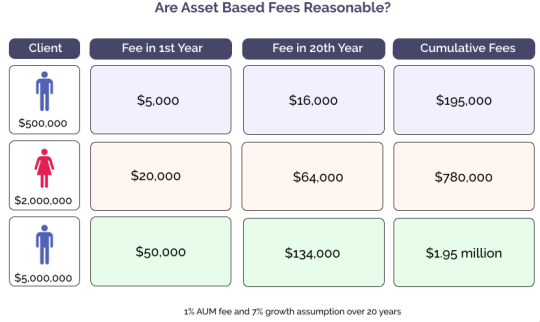 With a change to flat fees, over the course of 20 years, a $1 million portfolio growing at 7% would realize a savings of nearly $500,000 over a typical 1% AUM fee. The investor would save $287,000 in fees resulting in a 23% increase in total investment returns. The saying goes, “darkness is necessary for evolvement.” Coming into this business with a clean state and an open mind has been a luxury. While the temptation to operate under the status quo is understandable, I feel no pressure or obligation to do so. As I see it, tying a fee to the size of a portfolio just isn’t sensible. Ariadne will do things differently. Flat fees mean our clients see a substantial increase in value. Not only are fees more predictable and easier to understand, but the structure is much better aligned with Ariadne’s mission of providing intelligent investment management at a reasonable cost. I want Ariadne’s success to be measured in terms of people helped, not assets gathered. I believe adopting an equitable, flat-fee model is a big step in the right direction.